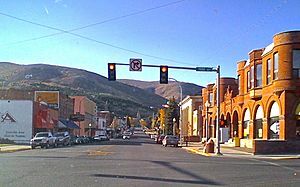 Anaconda, county seat of Deer Lodge County, which has a consolidated city-county government, is located in southwestern Montana of the United States. Located at the foot of the Pintlar Mountains, the Continental Divide passes within 8 mi (13 km) south of the community. As of the 2010 census the population of the consolidated city-county was 9,298, with a per capita personal income of $20,462 and a median household income of $34,716. It had earlier peaks of population in 1930 and 1980, based on the mining industry. It is still the ninth most populous city in Montana. Central Anaconda is 5,335 ft (1,626 m) above sea level, and is surrounded by the communities of Opportunity and West Valley. The county area is 741 square miles (1,920 km2), characterized by densely timbered forestlands, lakes, mountains and recreation grounds. The county has common borders with Beaverhead, Butte-Silver Bow, Granite, Jefferson and Powell counties. Anaconda was founded by Marcus Daly, one of the Copper Kings, who financed the construction of a smelter on nearby Warm Springs Creek to process copper ore from the Butte mines. In June 1883, Daly filed for a town plat for "Copperopolis", but that name was already used by another mining town in Meagher County. Instead, Daly accepted the name "Anaconda", suggested by the United States postmaster of the time, Clinton Moore. 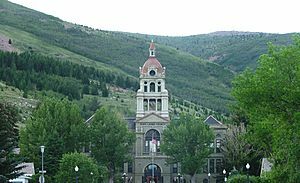 When Montana was admitted as a state in 1889, Daly lobbied to have the capital moved here, but it stayed in Helena, a location supported by rival William Andrews Clark. In 1903, the Socialist Party of America won its first victory west of the Mississippi when Anaconda voters elected a socialist mayor, treasurer, police judge, and three councilmen. The Socialist Party had grown within the expanding Montana labor movement. Initially, the Anaconda Copper Mining Company tolerated socialist activities, but when the Socialists gained political power and threatened to implement reform, the company systematically undermined the radical party. City workers and councilmen refused to cooperate with the new mayor, and the company began to fire Socialists. In the long run labor lost ground in Anaconda and the company exerted ever greater political control. The Anaconda Company expanded smelting capacity over time; by 1919 the Washoe Reduction Works could boast that its 585-foot (178 m) smokestack (Anaconda Smelter Stack) was the tallest masonry structure in the world and that the smelter-refining complex constituted the world's largest non-ferrous processing plant. In 1980, Atlantic Richfield Company closed the smelter, bringing an end to almost a century of mineral processing. While some aspects of the operation had been cleaned up under environmental laws, closing the smelter resulted in a large area contaminated with hazardous wastes. Since then, an operation for environmental cleanup was put into place by the federal Environmental Protection Agency and executed with the assistance of ARCO. The multimillion-dollar cleanup and redevelopment has resulted in the "Old Works" Golf Course, a championship 18-hole course designed by Jack Nicklaus. Part of Anaconda is included in the Butte-Anaconda Historic District. On main street is the Washoe Theater, which is listed on the National Register of Historic Places. 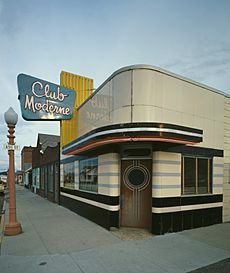 It was the last theater constructed in the United States in the Neuvo Deco style. The theater was designed in 1930 by B. Marcus Priteca, an architect from Seattle and opened in 1936. 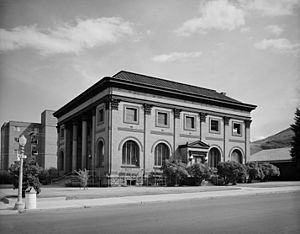 It was listed by the NRHP for architectural significance in 1982. It currently is used for showing films, plus periodically hosting plays and other types of entertainment. Hunting – There are hundreds of square miles of hunting available to the public in the area. With permit, hunting is permitted for fowl, bear, mountain lion, elk, deer and moose. Only deer and elk hunting is allowed without prior application to the state hunting license draw. Fishing – Many nearby mountain lakes and streams offer such primary fishing spots as Silver Lake, Georgetown Lake, Echo Lake, Storm Lake, Racetrack Lake, Warm Springs Creek, Warm Springs Ponds, and the Big Hole River. Golf – The Old Works Golf Course is a Jack Nicklaus-signature golf course, developed of brownfield land. 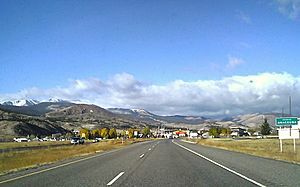 A local country club and an 18-hole championship golf course are located at Fairmont Hot Springs. Skiing – The area has many trails for cross-country skiers, and the nearby Discovery Ski Area has downhill skiing with 15 downhill double-black diamond trails and 5 kilometres (3 mi) of groomed cross-country ski trails. Darts -The annual Winter Getaway dart tournament, held in several local establishments, is the largest regional dart tournament in Montana. Museums – The Copper Village Museum and Arts Center provides visitors and residents with art and history of the local area. Hiking – Hiking opportunities in and around Anaconda include trails up to mountain lakes and a 10,067-foot (3,068 m) mountain that can be climbed A walking trail is on the north side of Anaconda next to Warm Springs Creek. Drag Racing – Lost Creek Raceway was founded in 1986 and hosts over 20 events a year bringing racers from Washington, Idaho and Montana. Special Events – There are many special events in Anaconda and near, from season to season. Anaconda, Montana Facts for Kids. Kiddle Encyclopedia.